Fenstermacher & Company was established in 1973 by William C. Fenstermacher, Jr., CPA when he purchased a two person accounting practice in Kennett Square, Pennsylvania. Bill leveraged his experience gained from working in the national accounting firm Touche Ross and his experience as a controller of a local mushroom growing company to build a firm that provides high level accounting and tax services while understanding the needs of the business owner. The firm has experienced controlled growth since its inception and now consists of twenty team members. Bill has instilled a culture in the firm that stresses client service and unwavering integrity. Bill’s son W. Chad Fenstermacher, CPA joined the firm in 2000. Chad holds a bachelors degree in accounting from the University of Delaware and a masters degree in taxation from Villanova University. As a manager in a large Wilmington, DE accounting firm, he worked with construction contractors, family owned businesses, professional service firms and not-for-profit organizations. Chad has brought his experience using the latest technology to provide quality cost effective services to the firm’s clients. 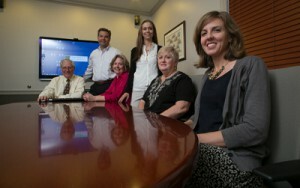 In 2013 the firm expanded when it merged with a Wilmington CPA firm (formerly Corcoran and Associates, P.A. ), allowing its practice to maintain full service offices both in Pennsylvania and Delaware. The expansion to Wilmington, Delaware helped mark Fenstermacher and Company’s 40 year anniversary as a growing area Certified Public Accounting firm. Fenstermacher & Company is committed to keeping current with developments in our areas of practice. All professional staff are required to complete continuing education courses of at least eighty hours every two years as required by the American Institute of Certified Public Accountants and The Pennsylvania Institute of Certified Public Accountants. The firm’s high regard for quality control is evidenced by the results of our tri-annual peer review reports. As a member of the AICPA we are required to submit our work product to review by CPA’s from other firms. Our commitment to excellence has earned us the highest rating in each review. Recognizing the value of quality control and in an effort to better serve its clients, the firm entered into a voluntary peer review program many years before it was mandated by the American Institute of Certified Public Accountants. View our 2014 Peer Review Report. Fenstermacher & Company’s experience and commitment to education and quality is brought together in the way that we handle our engagements. As a client of our firm you will have contact with at least two capable staff members who know your organization and understand your needs. This team approach to engagement management provides you with the security that you will always be able to contact someone who is familiar with your organization. It also creates the opportunity for dialogue among our staff people to develop ideas into workable value added suggestions for your organization. We are proud that our commitment to our profession and our clients has led to many long-term client relationships. We continue to serve individual and business clients across the country that have left the area but continued to retain our services and advice.